Flickr user maxedaperture has some shots online of Sunday night's fireworks, which were part of our 2006 Summer Blast Off here at Wolf Trap. WTOP's Man About Town Bob Madigan also highlighted the event in his on-air reports Sunday and Monday. Matt Sedlar's review of Saturday night's A Prairie Home Companion show is now available on DCist. The July 3 and 5 shows with Bonnie Raitt and special guest Keb' Mo' are now lawn only, as is the August 26 Kenny Rogers/The Oak Ridge Boys show. To find out which shows are on their way towards a sell out so that you can grab your tickets quickly, sign-up for Wolf Trap's email updates. This show is now sold out, but check back for last minute ticket availability by calling (703) 255-1868. To the right is a shot of the lawn at last night's A Prairie Home Companion show, which was sold out and broadcast live across the U.S. and Canada. We expect another big crowd tonight for the 2006 Summer Blast Off, which features a free concert by the United States Marine Band followed by fireworks. The gates opened at 7pm and the crowd came pouring in to get their seats. Tonight's show is general admission in-house, as well as on the lawn. 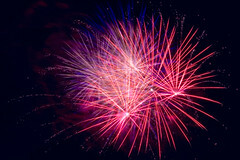 The music starts at 8pm and the fireworks follow the band. The turnout tonight is amazing. The concert by the U.S. Marine Band ended almost 15 minutes ago and the fireworks will begin in about 5 minutes. The Marine's bus just rolled by and the people seated on the hill outside the Press Office applauded as they drove past. If you're in the Vienna area, look towards Wolf Trap. It's the second night of the summer season and the second night of A Prairie Home Companion here at Wolf Trap. Tonight's show is a live broadcast, which you can check out right now on radio stations across the country. WETA 90.9 FM, which is based here in the D.C. area, carries the show and you can stream it live on their website as well. In just a couple weeks, A Prairie Home Companion will be released as a major motion picture, directed by Robert Altman. Here's what The Washington Post had to say about the movie. I'm having digital photo issues right now or I'd share some of the shots I took of the lawn tonight. The show is sold out and the weather is amazing, so it's a great lawn night here at Wolf Trap. Garrison Keillor had the whole place standing up singing the Star Spangled Banner just a minute ago and now it's intermission time. There were a few members of the media out here to catch the show this evening. I know of at least couple stories about PHC going online in the next couple of days and I'll pass links along once I have them. I'm logging off, but we'll be back out here tomorrow night for the 2006 Summer Blast Off...see you then. One more thing, if you're listening to PHC on 90.9 FM WETA or via WETA's online stream, be sure to keep your radio's on and catch Mary Cliff. Her show, Traditions, comes on every week right after PHC. Garrison Keillor and company went on stage about an hour ago and Wolf Trap's 35th Anniversary Summer Season is officially underway. Despite the thunderstorms that rolled through the D.C. area late this afternoon, we got very little rain here at Wolf Trap and the skies were looking good by the time the gates opened. Tonight is the first of back-to-back nights of A Prairie Home Companion. Tomorrow's show is a live broadcast beginning at 5:45pm and the show is sold out, but those of you in the Washington area can tune into WETA 90.9 FM or you can stream it online from anywhere in the world. You can also call 703-255-1868 to check on last minute ticket availability. There will likely be some live blogging happening on here tomorrow night as well. Then on Sunday night, we have a free concert and fireworks. Metro runs a shuttle from the West Falls Church Metro stop to Wolf Trap's Filene Center for summer shows, with three exceptions and this Sunday's 2006 Summer Blast-Off is one of those. The Metro Shuttle Bus Service is not available for the Blast Off, Wolf Trap Opera Company performances at The Barns at Wolf Trap, or for the International Children's Festival. 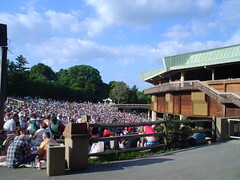 For all other summer performances at Wolf Trap, fans can Metro to West Falls Church and catch the shuttle from there. Metro charges $5 round trip fare per person for the shuttle. Further details are available in the Metro Access section of wolftrap.org. 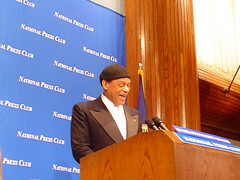 Back in March, Grammy-award winner Al Jarreau spoke at our 2006 summer season annoucement at the National Press Club and he fielded this question about one of his songs being performed on American Idol. Check out the part about him calling Ryan Seacrest. Based on the fact that Mr. Jarreau performed on the show's finale last night with Idol contestant Paris Bennett, it looks like his phone call worked. MR. JARREAU: I love it. (Laughs.) You know I love it. And what I love about American Idol is that, you know, they’re encouraging—(singing)—singing. People come on there and sing. You know, I don’t—you know, I don’t want to dismantle hip hop, but hip hop doesn’t encourage a whole lot of singing, you know. There’s some there, but it’s mostly rap. And so to find a program of such great popularity encouraging singing, that—I love it. And I called Ryan Seacrest yesterday and said invite me on. (Laughter.) I’ll sing, be a judge or whatever. I did; I did actually call. I met him on an airplane and told him how much I loved the show for those reasons, and I’ll come serve coffee. So—(laughter). Nice work, Al! We'll see you on August 6, here at Wolf Trap. Mat Kearney will be the opening act for Train when they visit Wolf Trap on July 24. Kearney's new album Nothing Left To Lose hit stores on April 18 and you can stream songs from the disc on his MySpace page. Toby Lightman will join Jewel as a special guest opener for her June 8 show at Wolf Trap. This will be Lightman's first appearance at Wolf Trap. Lightman currently has tracks available for streaming and downloading on her MySpace page, including "Devils and Angels," which has received radio play in the D.C. area and elsewhere, as well as songs from her new album, Bird On A Wire, which will be released this summer. Special guests for the May 26 and 27 A Prairie Home Companion with Garrison Keillor shows at Wolf Trap were recently announced. They will include Old Crow Medicine Show, Jearlyn Steele, and The Hopeful Gospel Quartet, featuring Carol Elizabeth Jones, Keillor, and Robin and Linda Williams. As mentioned in a previous post, the May 27 show, which will be broadcast nationwide (WETA 90.9 FM carries the show in the D.C. area) is now sold out. Tickets for the May 26 show are still available as of this posting and can be purchased here or by calling 877-WOLFTRAP. The June 1 Lynyrd Skynyrd show at Wolf Trap is now sold out, as is the May 27 performance of A Prairie Home Companion with Garrison Keillor. There are, however, still tickets available for A Prairie Home Companion on Friday, May 26. The special guests for those two PHC shows have been confirmed...stay tuned for details here soon. To find out which summer shows are close to selling out, sign-up for Wolf Trap email updates. They currently go out every other week and include details on which shows have sold out in the pavilion and are now lawn only. -->Wolf Trap received nice mentions in the Classical Music and Dance listings in the Summer Stages write-up in Sunday's New York Times. -->Wolf Trap's recent deal with PNC Financial Services is mentioned in the Local Briefing column in the Business section of today's Washington Post. -->The August 8 presentation of the Trey McIntyre Project at Wolf Trap is highlighted in this Washingtonian article on Michele Jimenez's departure from the Washington Ballet. -->An article in Thursday's Free Lance-Star on area music venues includes a section on Wolf Trap. There's a lot going on here in the Wolf Trap offices this week, as we continue to gear up for the summer season. That gets started on Friday, May 26 and you can expect to see a lot more blogging here once it does. -->Before the first show on May 27, we have our Wolf Trap Gala on May 23. The event raises money for our education programs and kicks off our summer season. -->A press release went out this week announcing that PNC Financial Services Group has been named as our premier sponsor for the 2006 and 2007 summer seasons. For more details, here's that release in PDF format. -->The Wolf Trap Institute for Early Learning is currently accepting applications for teaching artists. If you pick up a copy of today's Washington Post, you'll find an eight-page Wolf Trap supplement in the center of the Weekend section. The piece highlights our 35th anniversary season and includes a note from our President and CEO Terrence Jones, our full summer schedule, plus articles on Face of America: Hawai'i, the Wolf Trap Opera Company, and our musical and dance productions. Washington, D.C.: I've heard that Renee Fleming is performing in Washington this summer. Can you tell me when and where? And when was the last time she performed here? Thanks. I love your section. Scott Vogel: Thanks for the kind words! Renee Fleming's a particular of favorite of mine too, so I was glad to learn, as I'm sure you'll be, that she'll be performing at Wolf Trap on August 3rd (get your tickets now!) The concert will be led by Wolf Trap Festival conductor Emil de Cou in a program of French music. Ticket information for that August 3 Renée Fleming show is available at wolftrap.org. "Best Outdoor Music Venue in the DC Area"
Thanks to everyone who voted for us as "Best Outdoor Music Venue in the DC Area" on WJLA ABC TV 7's online poll. Wolf Trap was announced as the winner today on Good Morning Washington. We appreciate your support and look forward to seeing you out here this summer at the Filene Center. Our 35th anniversary season kicks off in three weeks! Want to know which shows are close to selling out? Wolf Trap sends out an e-mail update every two weeks to let you know which shows are lawn only, so that you can get tickets before they're all gone. Sign-up for the e-mail update here. WJLA ABC TV 7 has a Viewers Vote poll on their website, asking people "What is the Best Outdoor Music Venue in the DC Area?" You can probably guess what our choice is and you can go to wjla.com to place your vote. The poll is in the right hand column. Wolf Trap lets you in bring your own food and drinks (even beer and wine) to enjoy on the lawn. We're located just 3 miles outside the Capital Beltway. Parking is free. There's also a shuttle that runs to Wolf Trap from the West Falls Church stop on Metro's Orange Line for our Filene Center shows. We're also America's only National Park for the Performing Arts. Are we missing something? The comments section is open. Rock the vote. The results will be announced Thursday on Good Morning Washington. Tom Hanks references Wolf Trap on Letterman! If you tuned in to Letterman last night on CBS, you and millions of other viewers across the nation witnessed Tom Hanks reference to "opera at Wolf Trap" !!! As soon as we have the transcript and/or a link to the video, we will post it here. Kim Witman, Director of Wolf Trap's Opera and Classical Programming, and architect of the wildly popular Wolf Trap Opera Blog, should be mighty proud! 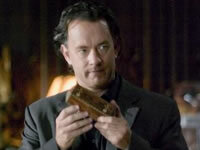 Maybe we'll see Mr. Hanks this summer!